The wait is over. The new Azendoo app is now available on iPhone and Android! This new app is built on a different technology, making it faster and more reactive than the previous version! You can now update your current app or download it below. This new mobile app is a huge step forward for Azendoo, and we are ecstatic to be making it available to all our users! 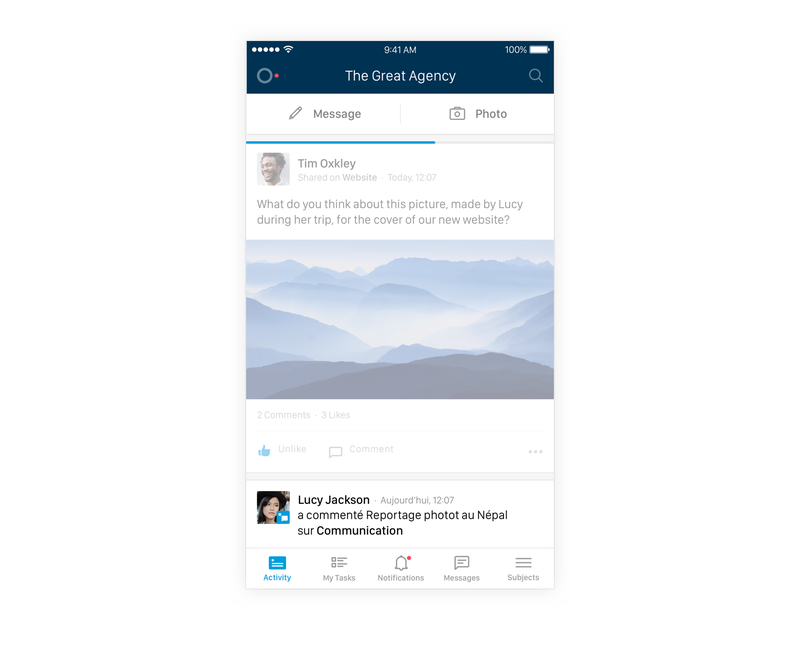 The Activity thread is the hub of all communications on Azendoo. Everything that concerns you and your team will appear on this thread, for you to view and take action on if necessary. This is where collaborative knowledge makes sense. You can access all activity happening in your Azendoo. Whether it it is Workspace activity, activity on a specific Subject, or even another member’s activity, you can see it all. 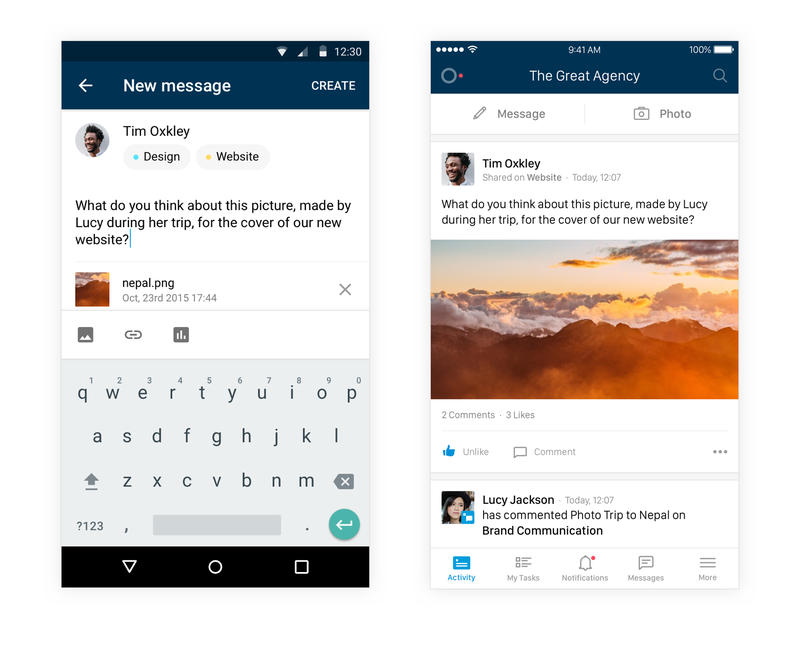 Of course you can also easily interact with all this activity: like and comment on any Message, or open Tasks to comment on them. It all happens naturally. 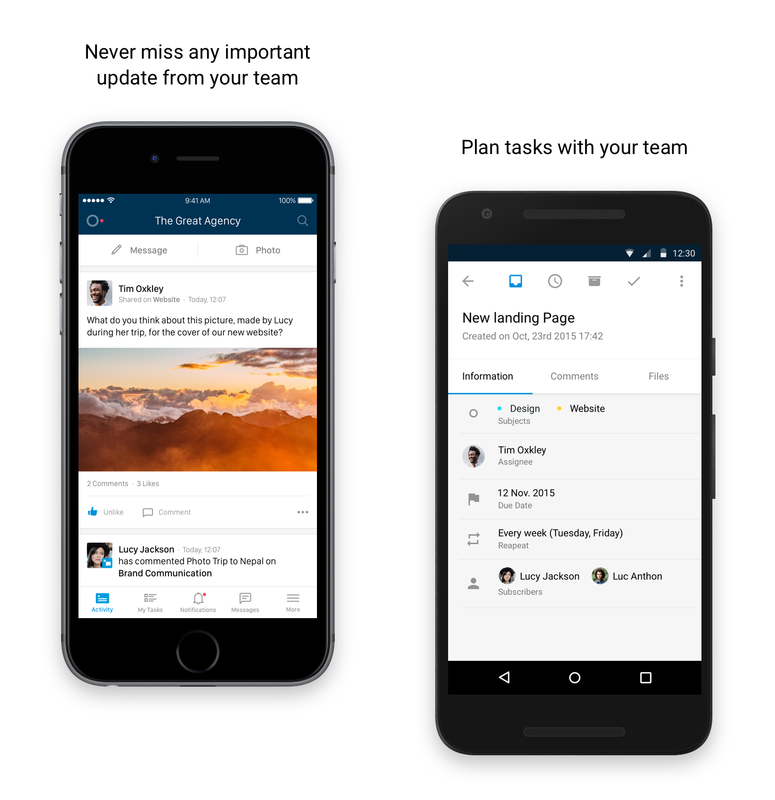 Azendoo Tasks is where all your work happens. 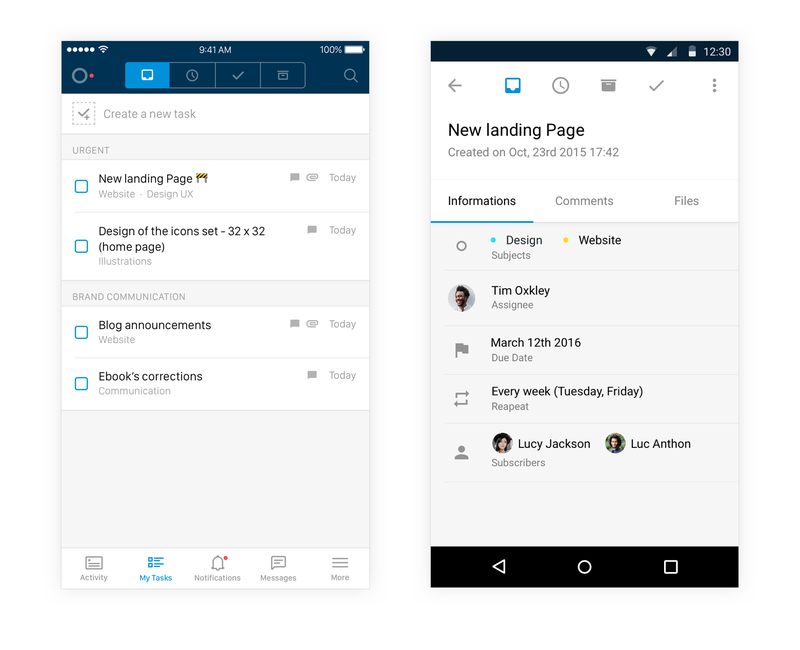 So we wanted to bring the best task-management experience to mobile, whilst maintaining consistency with the web app. All your Tasks can be accessed via the Task tab. Similarly to the web version, you will find your own Tasks as the default option, but you can select all your usual filters as well. A tap on the Task from within the Task list opens the Task card. The Task card is divided into three components, which will look familiar. All the actions that you can do on the web app can also be done here as well: delegate the Task, change its due date, add a description, add comments, and much more. 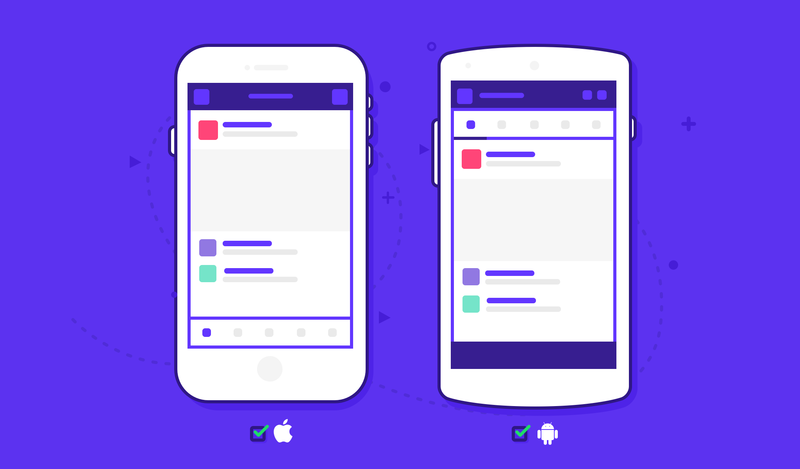 Notifications are essential for keeping track of what is going on in your teams and on your projects. 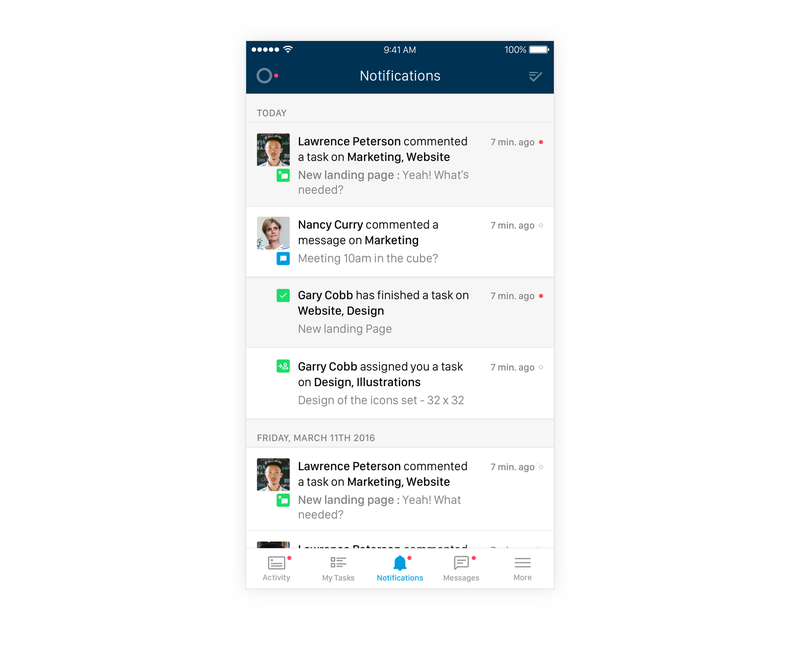 You will receive push notifications for new activity on the Activity feed, for Tasks, and for other notifications. The Notifications tab opens up a screen with all your notifications. You can scroll through them, and tap on the ones that interest you. This action opens the Task or Message concerned. You can mark all your notifications as read, via the icon in the top right corner. Read notifications can be identified by their slightly darker background. 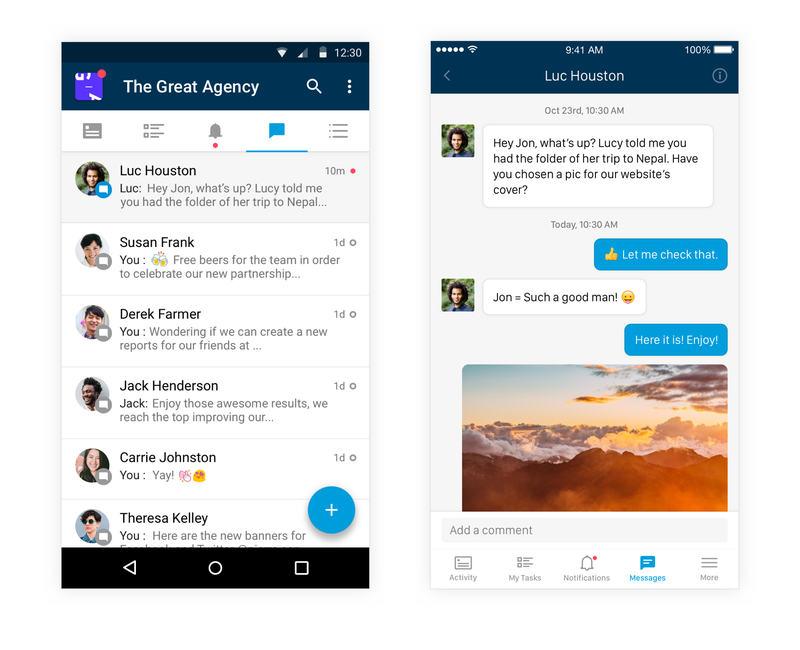 Direct Messages are now available on mobile too! Direct Messages were a great addition to Azendoo, because they made discussing with other members simpler, and they meant that this could be done without having to use other applications. So, it made perfect sense to add them to the mobile app, helping you to stay connected with your team whilst on the go. Simply tap on the Direct Messages icon to see all your contacts and start (or continue) chatting with them. The More tab gives you access to your team members and to your Subjects. Having access to your team members whilst on-the-go is important. So we’ve made it easy for you to reach out to them directly from the mobile app. 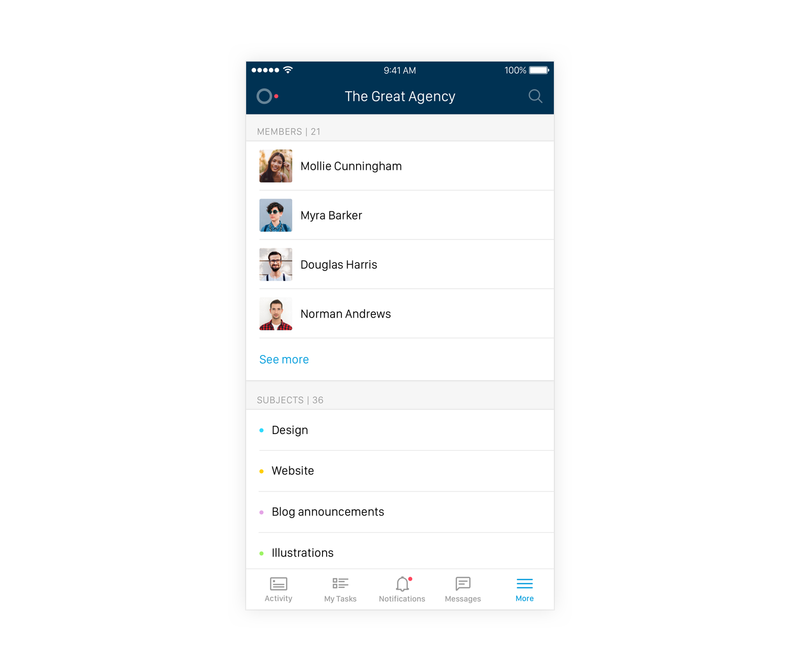 A simple tap on ‘See more’ will list all your team members. Tap on their name to open their profile. Once on their profile, you can send them Direct Messages, but you can also call them, or send them an email directly. Subjects are what make Azendoo so unique. They allow you to form small teams, in order to collaborate on specific Subjects. Subjects can be anything from a whole project, to a document repository, a process, a client, or anything else you see fit. You can access all your Subjects via a tap on the More icon. The Subjects you have favoritized will appear on top, and you can always use the Search icon at the top to find that particular Subject you are looking for. A simple tap on the Subject name opens its content: Activity and Tasks. The rest is rather intuitive, and works similarly to the Activity and Tasks tabs. A major improvement, compared to our previous mobile app, is that you now can upload and post images, and then continue using the app without having to wait for the image to be uploaded. The app will continue uploading and then post the image in the background. This is possible thanks to a new technology called React Native, developed by Facebook, which is in constant evolution and looks very promising. The new Azendoo app is now available for download on iOS and for Android. We will continue to work hard on this app for both platforms, and will offer updates frequently to make this the best possible app for you. In time, we will add more features and will also release Tablet optimized versions very soon. So stay updated for more!